1 Do I Cook Ribs Before Putting Them on the Grill? Fork-tender ribs are often cooked over low heat, which makes the cooking process lengthy. But by choosing the right kind of ribs and marinating them, you'll get a fork-tender meal every time. The longer you leave the ribs in the refrigerator to marinate, the more tender they'll be and the less cooking time you'll need. Fork-tender ribs make an ideal entrée when accompanied by side dishes such as corn and baked potatoes; they can also be served as finger food. Trim the excess fat off the ribs. Peel off the membrane. Rub cider vinegar over each side of the ribs. The vinegar helps open the pores of the meat. Mix the brown sugar, paprika, salt, pepper and garlic powder in a bowl. Rub half of it over each side of the ribs. Put the ribs in the fridge overnight. It will make them tender and ready for quick cooking. Add vegetable oil and water to a pan. Preheat the frying pan to medium-high heat. Add the ribs and cook covered for 8 minutes on each side. 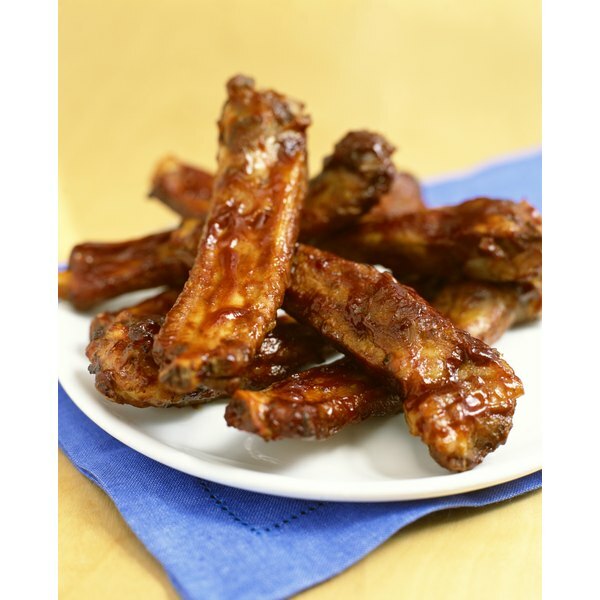 Brush the ribs with barbecue sauce occasionally as they're cooking.